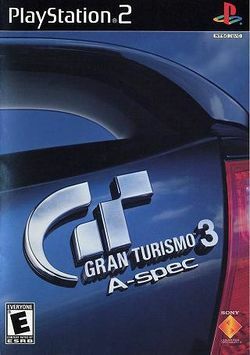 Gran Turismo 3: A-Spec (グランツーリスモ3: A-spec, Guran Tsuurisumo Surii A-supekku?) is a 2001 racing game and the first in the Gran Turismo series released for the PlayStation 2. During its demonstration at E3 2000 and E3 2001 the game's working title was Gran Turismo 2000. The game was a critical and commercial success and it went on to become one of the best-selling video games of all time. This page was last edited on 3 March 2015, at 00:18.